Ghillie moccasins are credited to the Scottish and Irish and they are still used today in Gaelic dance. The Romans had a very similar shoe called a Carbatina which was probably the precursor to the ghillie moccasins. While the history is not all that interesting, its use for thousands of years does prove the design is sound. The reason I love to make moccasins is because they are so simple to make. Also they can be made with thick leather or rawhide unlike most moccasin styles which use buckskin. There is little or no sewing involved and each moccasin is a single piece of leather. These Ghillie Moccasins are also very durable. They will last a long time with a little care and repair occasionally. They do tend to wear through rather quickly on concrete so if you plan on wearing them around the city I recommend adding a sole when you make moccasins. Old tires make pretty good soles as long as you get pre-steel radials. As you can see from the pic of the Roman Carbatinas, they needed repairs even back then. The right foot carbatina has a sewn up cut in it and the left carbatina is wore through at the heel. 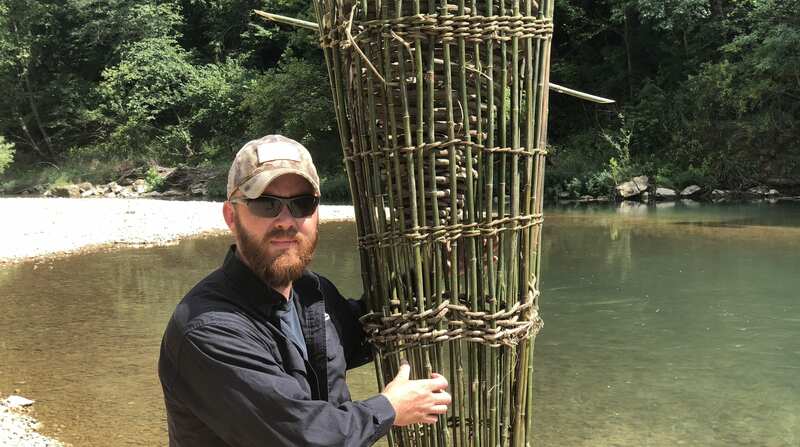 Learn More Advance Primitive Skills in our Advanced Standard Survival Course. The Japanese weave is an easy method for creating a carrying container that is not only functional but is also artistic. The benefit of this type of spoke basket over the simple over and under weave is that you do not need to remove or add an additional spoke. For instance with the simple over and under weave if you start out with 5 spoke, and each spoke doubles into 2 spokes, you end up with 10 spokes. Since you can’t have an even number of spokes with the over under you either have to remove 1 spoke or you have to add 1 spoke. But if you’re making a Japanese weave basket 10 spokes is absolutely fine. However with the Japanese weave you cannot have spokes in multiples of 3. So if I started with 6 spokes which when doubled becomes 12 spokes it would not work with a Japanese weave. The difference between the two types of weaves is very subtle. With the over under method of weaving, obviously, you weave the weavers over one spoke and under the next. But with the Japanese weave you weave the weavers over one then under two spokes or vice versa. It seems like a small difference but it creates a rather distinct visual difference. The Japanese weave appears to spiral around the basket giving it a rather unique look. Let’s walk through this process together. The first step is gathering material. For this tutorial I’m going to use an invasive plant that is common around here, called Winter Creeper. Winter Creeper is an evergreen vine from Asia that was brought to America as an ornamental ground cover. It has escaped and naturalized over much of the country. It is flexible and easy to gather anytime of the year. I have an abundance of it growing near here so that’s what I’m going to use. You can use anything flexible that you have access to. Now we need to separate out our thickest vines and cut them to shape to use as spokes. We can have any number of spokes as long as the number is not divisible by three. Now remember each spoke will be doubled over and used as two spokes so take that into consideration when figuring. For this tutorial I am using eight spokes which when doubled over will equal sixteen spokes. Sixteen is not divisible by three so the math works. I am making a small basket so I cut the spoke length at a little over a foot. Now we will take half of our spokes and cross them over the other half of our spokes making a cross with four spokes in each section. Holding our spokes in place, we take our thinnest vine and start wrapping around the spokes where they cross to hold them together. Two or three wraps is usually enough to hold them in place. Now we begin the weaving process. With the Japanese weave the process is over one and under two or over two and under one. As we weave we also need to spread the spokes until all the spokes are about an even distance from each other. Keep weaving out until the base is about the size you want for the bottom of the basket and then start bending your spokes up. Don’t make any dramatic bends or the spokes might break at this point. Just slowly bend them up as you weave. Not only is it safer to slowly bend them up but it also looks better in my opinion. Now all we have to do is build the walls up as high as we want. While I’m making a pretty small basket in this tutorial, these baskets can be nearly any size or shape. tually much easier to do than it is to explain. Hopefully the pictures will show what I mean in a less confusing way. Once you have done that to all the spokes the basket is done. Of course you can add a handle as well but that is another lesson. I hope that this tutorial has been useful to you and I would love to see what you create. If you have any questions or want to show off your creations, be sure to post them to our Facebook Group Sigma 3 Survival University. As always, don’t just survive, thrive. Please share this post to get the word out to all bushcrafters and survivalists! FOR 45 DAYS WITH LIMITED MODERN TOOLS? Welcome to SIGMA 3, the leading school in extreme survival, tailored for only the bushcraft elite. Do you have what it takes to become a certified Sigma 3 instructor? Can you survive being dropped in a remote wilderness with nothing but a knife? Are you confident that you could build a waterproof shelter, start a fire and procure water using only that blade? Do you want to add on to your already extensive bushcraft knowledge to become the ultimate level of survival expert, a Sigma 3 instructor? We are casting men and women who want to take on Sigma 3’s intense 45-day instructor test for a new show on a MAJOR CABLE NETWORK. If you think you have what it takes email: [email protected] right away with SUBJECT LINE: CASTING: YOUR FULL NAME. Please include a few photos of yourself and tell us about yourself and your experience with wilderness survival and bushcrafting. Sure there are tons of articles and info out there on the subject of fatwood, so what makes this one different. In this article, we plan to reveal a few things you probably didn’t know about it and what works best when using it. This survival blog will even show you how to make it on your own if you can’t find any good fatwood. Fatwood, is a resin impregnated pine wood that can be found on pine trees and is probably the best natural fire starter available. It’s waterproof, rot resistant, extremely flammable, and in abundance when pine is in the area. Most evergreen trees contain terpene in their tree sap. This sap flows to an area that is scarred and damaged, attempting to heal that area. As the terpene evaporates in the sap it will harden, becoming resin and over time it will not be sticky any longer. The resin at all stages is flammable and burns well. This same resin can be used for pitch glue and all types of bushcraft needs. The best way to find fatwood is to find fallen dead pine trees that are on the ground. When a tree dies the terpene in the wood will move to the interior heartwood of the tree and it will saturate the inner wood creating fatwood. Sometimes you can find sections of it the size of a small tree, within the inside of a large fallen rotten tree. You can also dig around rotten pine stumps to find large sections of it as well. Remove the punky rotten material from around the fatwood and this wood will be golden in color and very resinous in feel. You will also smell a heavy scent of turpentine in the wood and the stronger the smell the better the wood. Fatwood can also be found in the lower branches of the tree in the small node that connects the branch to the tree. Where the tree connects to the trunk, is usually where it is found and most times it can be 2-6 inches in length out along the branch. Spruce fatwood is found only a couple inches up the branches and does not have as much fatwood as pine. Having some fatwood in a tinder box or tinder pouch , can be very useful in all type of weather conditions. So see if you can find some in your area then you definitely want to store it for later fire making uses. Fatwood makes a great tinder anytime, it will burn long and hot. When in wet conditions, its used for drying damp materials so they will combust into flame and this can make the difference with marginal wet tinder material. It will catch almost anything on fire if you have enough of it. Large sections of it can also be used as a torch for lighting purposes around camp. Put the fatwood into the spears we make on the youtube channel and have a portable torch you can use for light in the woods. These can be used to attract fish for night time fish spearing as well! Since the fatwood puts off a tremendous amount of toxic smoke, this can also be used to combat mosquitoes in your camp. You do not want to breath fatwood smoke though, so caution should be used when in primitive shelters. Some people even take large sections of fatwood and make them into walking sticks so they are insured to always have a great firestarter. How to make your own fatwood? If you can’t find any fatwood in your area then you simply need to make some. It is so simple to make fatwood and you will have the same types of results as the natural fatwood. All you need do is melt your sap down in a container large enough to soak your sticks into. Once the sap is melted completely in the container, then add your finger sized sticks of cedar or dried pine to the melted sap. Lightly simmer the sticks in the sap for around 30 minutes and make sure you don’t get fire to hot or the sap will ignite into flame. Once the sap has soaked into the pre-cut sticks, then all you need do is let them air dry and they are ready for fire making. Boiling container; preferably something you don’t mind ruining such as an aluminum can. Methods to prepare fatwood for fire starting is most commonly done in a two ways. The first is by taking a knife and thinly shaving off the fatwood to make shavings. The shavings should be thin and usually will be curled. A small pile the size of a golf ball or larger is a good amount. The shavings will light easily by using a flame or even sparks from a ferrocerium rod. The second way is by taking a sharp edge on the spine of a knife and scraping the fat wood to make a sticky dust. Also, the fine dust can be scraped off with a sharp stone, a piece of broken glass or other sharp object. After getting a small ball of dust in a pile you will be able to light this with a flame or ferrocerium rod. The SIGMORA (Official S3 Survival Knife) has a custom scraper on the back that makes perfect scrapings of fatwood for catching sparks and it is our preferred tool for this job. Fatwood is probably the single best fire tinder you can carry with you and is usually in great quantity if pines are in the area. This tinder is even better than birch bark and many modern tinders as well. It’s free, abundant, and one of the most useful fire making tinders you can harvest. Go out and get some and try it today! You’ve made yourself a workable bow. You fashioned some fine primitive arrows. You camouflaged yourself and you’re ready to go hunt some meat. You carefully stalk up on a deer. You knock an arrow and prepare to aim, but wait. You have a handful of arrows. What are you going to do with them? You can’t hold them while you shoot and if you drop them you will spook the game. You just discovered an age old problem experienced by ancient and modern hunters alike. Something to carry arrows in is essential to good hunting. A primitive arrow quiver is a must have if you going to be primitive bow hunting. To solve this problem you are going to need primitive bow quiver. There are many different varieties of primitive bow quivers, the world over, but the quiver we are going to make today is a basket quiver. I prefer to use willow for this type of quiver, at least for the spokes, but you can use nearly any type of flexible twigs or vines. The reason I prefer willow is because you can bend it sharply without it breaking and it looks nice. 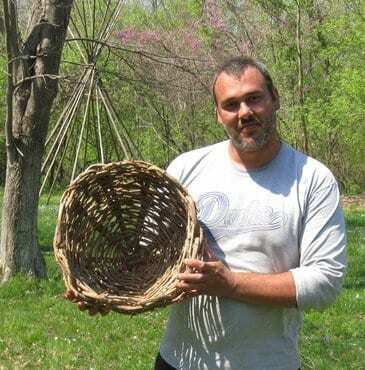 Now you can make primitive arrow quivers out of a lot of primitive materials such as elm bark, birch bark, leather, vines, flexible twigs, or even roots. Almost anything flexible will work. Check out the Elm Quiver to the right! The steps to making a primitive bow quiver are pretty simple. First you have to gather and process material. Now you choose your five thickest willows for your spokes. You make a cross alternating your willows from the thick to thin. Three spokes, north to south and two spokes east to west. You wrap the cross with your thinnest willows, over the north and south and under the east and west spokes several times, to hold it in shape. You remove one of the spokes to make an odd number of spokes. Then you wrap the spokes, over and under alternately, until you have a round base. Then you fold your spokes up and keep weaving until the basket is the height you want. You tuck your spokes in and make a rim. And finally you attach a carrying strap. Of course this is an overly simplified explanation but you can find the details in our attached video. Now when you take aim at your game and reach for your arrow it will be waiting patiently next to all of its brothers in its handy carrying case that you made with your own hands. And you will look amazing wearing it. Please share your successes and failures with us and feel free to ask us any questions. Watch the video for exact details on how to build this nifty little bow quiver!